Riverfront Park\'s new dining spot. Just a few dozen feet from the Rotary Fountain in Riverfront Park, where you can’t tell if the sound of squealing is coming from the children prancing through the spouts or the seagulls swarming the pavement, a new cafe feeds downtowners. 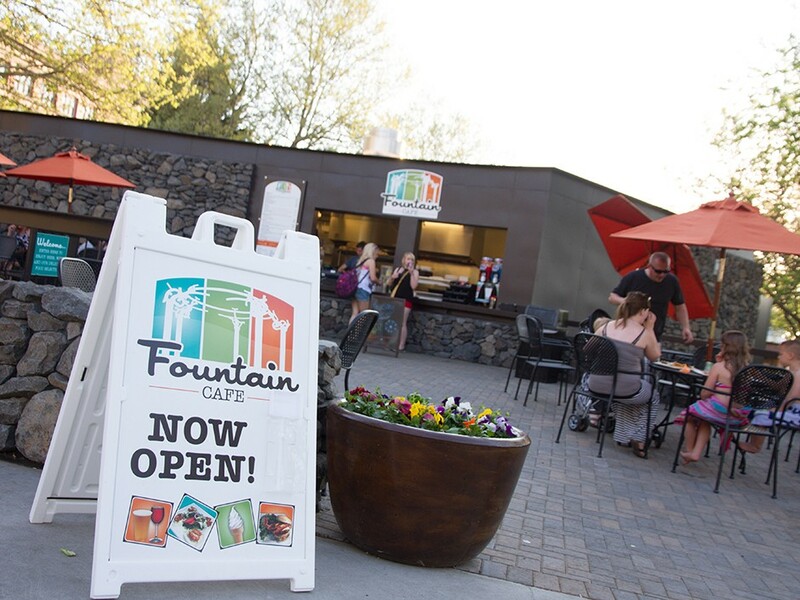 Construction for the Fountain Cafe began in November and the cafe opened the last day of April. The idea to put the cafe in the park resulted from a need to have permanent restrooms by the fountain. Sam Song, the food and beverage director for Spokane Parks and Recreation, says they realized the park was lacking a decent attractive dining area, so a plan for the cafe was submitted and approved. The all-outdoor-seating cafe will remain open through the summer and into the fall, as weather permits. Its menu goes beyond the regular concession-stand hot-dog-and-ice-cream grub. “We kept popular items for park visitors and added some gourmet choices for downtown people,” Song says. The flatbread with sun-dried tomato and feta ($6.95), which we tried, is a small and simple appetizer with a sparse sprinkling of the chunky ingredients. The flatbread, which has another choice of grilled artichoke on mushroom pesto with Parmesan, is among some of the more nontraditional park food. Among appetizers, you can also get a hummus platter ($6.95) with grilled pita, kalamata olives and cucumber. Entrées — served with chips, fries or salad — include Cajun Andouille Sausage ($6.95) and four shrimp tacos with Cusabi dressing ($8.95). Some of the more basic items on the menu are burgers ($7.95-$9.50), grilled cheese sandwiches ($6.95-$8.95) and wraps ($6.95-$7.95). The kids’ menu also includes a turkey dog ($4.95) and macaroni and cheese ($4.95). Right now there’s one beer on tap: No-Li’s Born & Raised IPA. Golden Hills will be added later this summer, Song says. The cafe also carries a selection of bottled beer — including Budweiser, Corona and Kokanee — and wine. A hint of chlorine can be smelled from the sunny park patio, making it feel a bit like a food pit stop in a water park. But it’s a prime spot to perch yourself and watch the bare-shouldered skateboarders and mini-bikers ride by, or if you’re a parent, watch your kids as they cool off in the fountain.